The Syrian government is trying to press on the citizens using any methods possible in order to terrorize and submit the Syrian community. Not only it tried to crush the opposition overwhelmingly, it is also focusing on anyone with “questionable” allegiances through it is intelligence network. A simple warrant is suffice to arrest anyone or dismiss him from his governmental job to take away from him his source of livelihood especially if he was formerly arrested after the breakout of the popular protest in March 2011. Many governmental employees were able to get back their jobs after they were arrested by the security branches due to the fact that many of those arrests were arbitrary and weren’t ordered by a court where they spent most of their terms in detention centers that are affiliated with security branches. After interrogation and torture, they are released in light of the utter absence of judicial authority which is almost completely under the control of the security branches. The first decision was made in June 2014 and resulted in dismissing hundreds of governmental employees in various governmental branches including services, health, education, police, and local councils. The employees that were fired were also denied their financial entitlements, health insurance, and compensation regardless of how many years they worked. 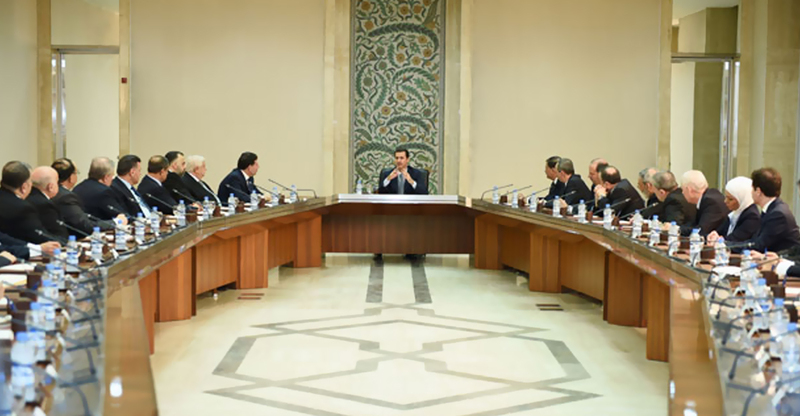 The second decision was issued in October 2014 by which the Syrian authorities asked all the employees to show a document that prove that they are wanted by the reserve forces. If an employee fails to obtain this document, he will be fired. This decision was after government forces started its conscription campaign in October 2014 which is still ongoing as hundreds were detained, kidnapped, and forced to join the military and fight with government forces as we noted in previous reports. The third decision was issued recently on Wednesday 28 January, 2015 where three governmental employees were dismissed in Hama – As-Salmiya city.